Industry acceptable certification for MCSA training which help fresher/Experienced to up-skill at corporate. Certified & expert system engineer with 10 -15 Years of experience delivered MCSA training. After completion of 70% MCSA training our dedicated placement team arrange interview till placement. Microsoft Certified Solutions Associate (MCSA) is a certification training program offered by SLA Consultants India that is aimed for candidates who are looking for entry level jobs in IT field. It is a Basic MCSA Course that helps the candidates to learn fundamentals of Microsoft programs and allow them to proceed to other high level certifications. SLA Consultants India offers the most reliable and high quality MCSA Certification Training Course for participants who are looking to lead a career in Microsoft solutions and aims to become an IT professional. In this MCSA Training MCSA Course, we provide the participants with details on Microsoft Server 2008, Microsoft Server 2012, SQK Server 2012, Windows 7 and Windows 8 and how to configure and install them to perform the necessary tasks. SLA Consultants India designed the Microsoft Certified Solutions Associate(MCSA) Certification Course help with all the latest industry focused modules taught by most experienced and qualified trainers available. We take immense pride in our teaching that deliver the students with all the significant aspects of Microsoft softwares and makes them capable of becoming an important asset for any IT industry. The MCSA Course will provide participants with knowledge on computer systems, Microsoft softwares networks, and other related concepts. The students will gain in-depth understanding on how to install and configure Windows Server 2012 and latest Operating Systems, implement DHCP and DNS, implement local sharing, storage and many useful functionalities employed by every small and large scale industries. We not only provide the participants with the required comprehension, but also makes sure that they finish the MCSA Course successfully and enroll themselves in a highly reputed company. We provide the students with great infrastructure, reliable faculty and management, live projects and lab sessions, Real-time MCSA Training, free online video tutorials and access to forum. The duration of the MCSA Course is 1.5 – 2 months and once the MCSA Course is completed, the students can opt from different job titles that include Information Technology manager, Network Administrator, IT Director, Senior Systems Administrator, Network Engineer, etc. The students in SLA Consultants India are assured a guaranteed 100% job placement in any of our associated companies, so you don’t need to be concerned about finding a relevant job opportunity for you. There are many vital reasons to pursue the MCSA Certification Course that would help the students to lead a better and successful career ahead. Below are given some of those important motives, which you can find out. MCSA is a basic level Certification Course by Microsoft that allows the students to become eligible to pursue advanced level courses. Thus, if you want to become a Microsoft solutions expert, you need to start from here. It will provide you all the fundamental Microsoft information on how to install, configure and implement major Microsoft tools such as Microsoft Server 2008 and 2012, MYSQL Server 2012, Windows 7 and 8. After the completion of the certification, you can join other higher level courses such as MCSE, MCSD, MCPS and MCT. Joining MCSA would make a permanent member of Microsoft community and you can enjoy benefits accessing Microsoft’s events and conferences. Having an MCSA certification would make you the most desirable candidate when you attend an interview in an IT industry. The job opportunities after completing the MCSA are huge which is increasing day by day. Furthermore, salary offered to them are relatively higher than the others. You will also be more eligible for rapid promotion as you will be handling one of the most important elements of the company. These are only a few advantages of pursuing an MCSA Certification, which you can enjoy after the completion of this short duration job oriented course by SLA Consultants India. The fee structure and batch timings are very flexible and preferred by most students. Take demo classes to know more about the Certification Course. Please find the MCSA course details. Kindly call us @ 9350319190 for MCSA course details! What is a MCSA certification? The Microsoft Certified Systems Administrator (MCSA) certification is the industry standard for showing competence in handling as well as troubleshooting network environments depend on the Windows Server 2003 operating methods. Offered the wide usage of Microsoft Windows Server operating systems, several IT professionals make use of the MCSA to show their skills in this area. The MCS certification is particularly appropriate for systems administrators, network administrators, network operations analysts, information systems administrators and even network technicians. How do you get a MCSA certification? The full form of MCSA is a Microsoft Certified Solutions Associate. This certification is offered in seven different specialization areas and is usually pursued by information technology experts who are looking to proceed their careers on the ground of network systems and technical assistance. Technical institutes providing Computer Systems Administration degrees can also be set up in the well-admired choices. MCSA programs are usually offered at secondary schools and online in each certification. Why SLA Consultants India for MCSA traning? 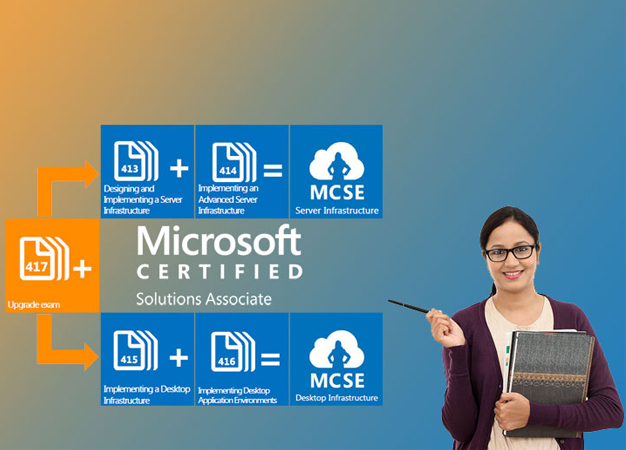 SLA Consultants India has planned the Microsoft Certified Solutions Associate(MCSA) Certification Course assist with different advanced latest industry paying attention modules taught by most knowledgeable and qualified trainers offered. We take huge pride in our teaching that offers the students with all the important perspective of Microsoft Softwares and turns them capable of turning a significant asset for any IT trade. An MCSE refers to (Microsoft Certified Systems Engineer) is somebody who has passed the exams of the Microsoft Windows NT operating method, linked desktop systems, networking, as well as Microsoft’s BackOffice server items. In order to prepare for the exams, you can follow the paths at a certified training center, in certified courses in a high school or even college, or all through self-study at Microsoft’s self-study Website or all through certified training stuff. Where is a Best institute of MCSA Training? SLA Consultants India provides the best MCSA training in Delhi that is completely based on updated industry trends, parameters as well as standards that provide attendees to find jobs quickly and easily at various MNCs. SLA Consultants India offers Best MCSA training in Delhi and earned a great name in the industry. You can contact at the Delhi office for more information and queries. What is Active Directory Certification Services (AD CS). Active Directory Certificate Services are an Active Directory tool that allows administrators personalize their services in order to the problem and handle public key certificates. Applications assisted by AD CS include Secure/Multipurpose Internet Mail Extensions (S/MIME), Internet Protocol security (IPsec), secure wireless networks, virtual private networks (VPN), Encrypting File System (EFS), digital signatures, Secure Socket Layer/Transport Layer Security (SSL/TLS) and smart card login.